Qualità Oro is a selection of extraordinarily sweet, 100% fine Arabica coffees. An intense, aromatic blend for true coffee connoisseurs. Tradition, expertise, passion – these are the virtues that make the Lavazza Qualità Oro a premium- caffè not to be missed. This is the way it has been for over half a century, when these values were first established in 1956 in Turin by Luigi Lavazza. His expertise and knowledge of making the perfect espresso have been passed on from generation to generation ever since. Treat yourself to the taste of a genuine premium Italian espresso. Qualità Oro from the masters of Lavazza is a true favourite of Italian coffee lovers – an experience that couldn’t be more enjoyable if you were sitting in an Italian piazza. The inviting golden crema, the full bodied aromatic taste of 100% Arabica espresso, the incomparable fragrance … this truly is the perfect coffee for connoisseurs who expect the absolute highest quality with every sip. The best part: this is an experience that can easily be enjoyed at home, whenever and however you like. The Lavazza Qualità Oro is suitable for any preparation method; you can brew it by hand, with a coffee filter, using a French Press or with a coffee machine. You can even prepare it in any form you desire: whether served as an espresso, cappuccino or latte macchiato; the Lavazza Qualità Oro guarantees the unique taste and perfect blend that can turn everyday moments into something truly special. Indulge yourself with 100% Arabica lavati, the gold standard of Arabica beans, carefully sorted and washed (Italian: "lavare") using a method reserved for only the finest coffees. The washing guarantees the full aroma and soft taste of this espresso blend, in which the long-standing experience and passion of the Lavazza coffee experts is evident. The Lavazza Qualità Oro uses only the best beans carefully selected by our coffee making experts. Arabica beans selected from Central America, providing a fruity and floral taste, and Brazil, contributing a touch of malt and honey, are mixed together masterfully to create a unique blend that is sweet, aromatic and simply irresistible. Treat yourself, your friends and your family to the very best. 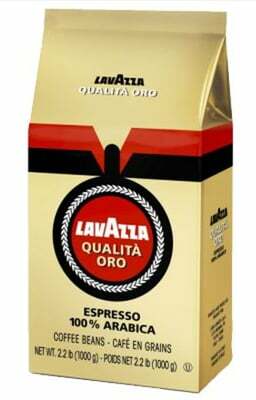 The Lavazza Qualità Oro is easily identified by its shiny golden packaging. The high quality of our premium espresso ensures that you enjoy every single sip.